Left: Linear and lobate morphologies on the highest reaches of Aeolis Mons were shaped by glacial activity in the past. Right: Breiðamerkurjökull glacier, Iceland, a terrestrial analog of the glacial remains identified on Gale. To carry out the study, the team has used images captured with the HiRISE and CTX cameras from NASA's Mars Reconnaissance Orbiter, together with the HRSC onboard the Mars Express probe managed by the European Space Agency (ESA). 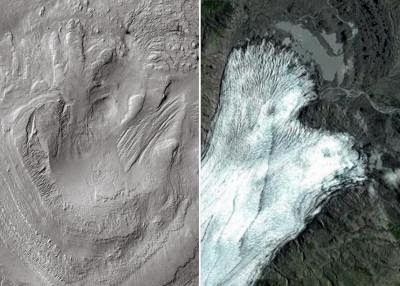 "For example, there is a glacier on Iceland –known as Breiðamerkurjökull– which shows evident resemblances to what we see on Gale crater, and we suppose that is very similar to those which covered Gale's central mound in the past," says Fairén. Citation: Alberto G. Fairén, Chris R. Stokes, Neil S. Davies, Dirk Schulze-Makuch, J. Alexis P. Rodríguez, Alfonso F. Davila, Esther R. Uceda, James M. Dohm, Victor R. Baker, Stephen M. Clifford, Christopher P. McKay, Steven W. Squyres. "A cold hydrological system in Gale crater, Mars". Planetary and Space Science 93-94: 101–118, 2014.